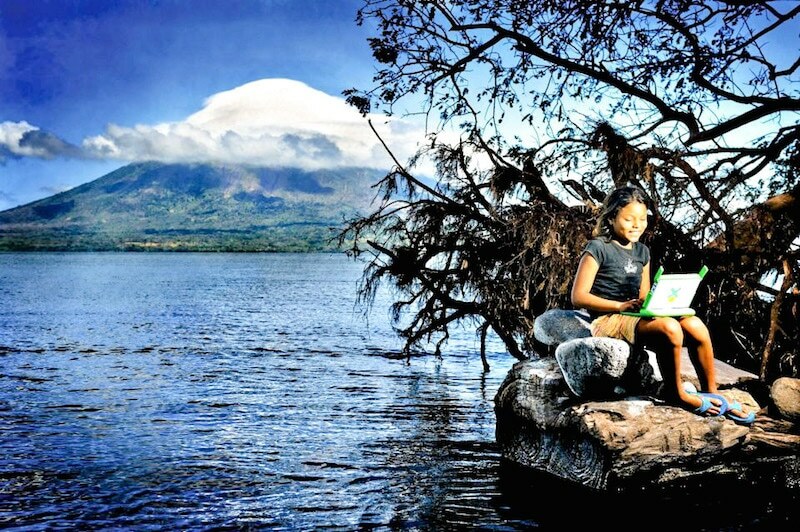 In the heart of Nicaragua lies the largest lake in Central America, Lake Nicaragua. Millions of years ago, a volcanic eruption formed a curious island in this freshwater lake composed of two volcanoes — Concepcion and Maderas — the former of which is still active. Concepcion has an altitude of 1,610 meters, which makes Ometepe the world’s highest island on a lake. Volcanic ash has created an extremely fertile island and the volcanoes are visible everywhere on the island. Ometepe is truly a paradise, with its tropical, lush and magical air and soil. Far beyond the idea of giving computers to children with “an educational purpose”, like if education meant just providing content to be consumed, the origins of the learning philosophy of OLPC has been to provide kids with computers so that they can compute. Seymour Papert believed, supported by decades of research, that by computing (coding, programming), the learner could be empowered to understand, create and think about their own learning, especially at early childhoold. This panel from the Spring 2014 Member Event at the MIT Media Lab will explore more in detail the learning vision of Papert. Enjoy! Panelists: Mitch Resnick, Marvin Minsky, Alan Kay, and Nicholas Negroponte. Mark Warschauer, Professor of Education and Informatics from the University of California, Irvine and Binbin Zheng, Assistant Professor from the Michigan State University, recently posted an article asking if there is a need to abandon attempts to integrate technology in schools due to a recent international study published by the Organization for Economic Cooperation and Development, which found no positive evidence of impact of educational technology on student performance. …own extensive observations. We conducted a synthesis of the results of 96 published global studies on these programs in K-12 schools during 2001-2015. Among them, 10 rigorously designed studies, mostly from the U.S., were included, to examine the relationship between these programs and academic achievement. We found significant benefits.We found students’ test scores in science, writing, math and English language arts improved significantly. And the benefits were not limited to test scores. To find out about their conclusions and read the full article, please click here. Mark Warschauer has received funding for his research from the National Science Foundation, the Institute of Education Sciences, the Carnegie Corporation, the Smithsonian Center for Learning and Digital Access, the Spencer Foundation, the John Randolph Haynes and Dora Haynes Foundation, and Google Research. El cerebro no se jubila. Esta nota se propone exponer el mensaje contundente de la gran bióloga italiana a la luz de Ibirapitá, el nuevo programa de inclusión digital del gobierno del Uruguay que ha comenzado a distribuir tabletas conectadas a Internet a las personas jubiladas con ingresos reducidos. Es decir, los mayores de 65 años contarán con los mismos recursos digitales que ya sus nietos han recibido a partir de los 5 años, gracias al “modelo uno a uno”, una laptop/tablet por niño del Plan Ceibal (www.ceibal.edu.uy). De esta manera se está construyendo en el Uruguay un amplio y generoso puente digital que abraza 60 años de vida. Este programa de inclusión digital inter-generacional, el primero de su tipo en el mundo, merece destacarse y ser imitado. Pueden leer el documento aquí. The OLPC Canada team is excited to share a new animated video highlighting some of the inspiring outcomes when Aboriginal students are connected with educational technology. Please help us build awareness of this initiative by sharing this video on Facebook and Twitter and liking it on Youtube. OLPC Canada provides 21st century educational tools to Aboriginal students nationwide. To date, they have connected more than 60 Aboriginal education programs and 9,000 students to technology designed with children in mind. Please help raise awareness about this initiative by sharing this video. It takes a network to connect a child. OLPC is grateful to the Grupo Lafise for its continued support for the One Laptop Per Child program. Thanks to its generous donations, OLPC continues to change the world, one child at a time.